A joint command and control system that is intended to be fully operational in the coming year will focus on efforts to identify and counter the threat of weapons of mass destruction, the American Forces Press Service reported Wednesday. 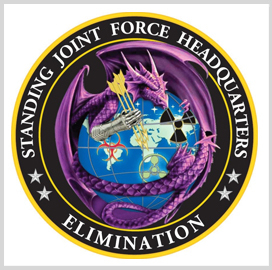 Donna Miles reports the Standing Joint Force Headquarters for Elimination was formed in February 2012 to better equip geographic combatant commanders for anti-WMD programs. Army Maj. Gen. Lucas N. Polakowski, commander of the SJFHQ-E, said the new force supports President Obama’s national security strategy of dismantling WMDs in hostile nations. “It is such a specialized area, so [the combatant commands] don’t have the complete depth of [chemical, biological and radiological] and counter-WMD expertise that we have resident in these three organizations,” Polakowski told the American Forces Press Service. “These three entities, under the headquarters mantle, would provide that resource and expertise to the combatant commands and any command underneath them,” he added. When the command is ordered, it will go into foreign nations to locate, characterize, secure and disable or dispose of hostile WMDs and WMD programs.